ESR | May 19, 2003 | What happened to seriousness? Remember those heady days following September 11th when we were all going to get serious? This clearly is different from getting physical and certainly has nothing to do with Olivia Newton John -- so far as I know. Some people have gotten the memo, others have not. 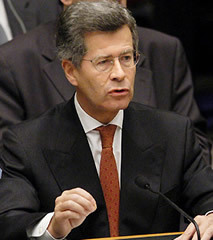 French Ambassador Jean-David Levitte reportedly was to send a letter to top Bush aides and lawmakers complaining of a nine-month "organized campaign of disinformation"
Where else does one start when talking about these sorts of things than with our good old friends the French? They let their ambassador in Washington send out the equivalent of what can only be seen as a spammed email to various branches of the U.S. government complaining about a campaign of propaganda. I could actually see the subject line: "France to U.S.: Stop being so mean." The French claim this amounts to, "untruthful accusations which have appeared in the American press and which have profoundly shocked the French." Shocked the French? My oh my! It is the kind of thing that if they did email it, they probably would have blind copied it to all their little friends and had a good laugh over some wine and smelly cheese. This is supposedly a major power in the world, a nuclear power, a major pillar of the European Union, and member of the exclusive veto club of the United Nations. And this is what we call seriousness in 2003. The official U.S. response? I think it was Condoleezza Rice who might have said in a moment of weakness: "Oh no we didn't" But for fun here is what the Chicago Sun Times considered the real U.S. retaliation: "Meanwhile, military officials said Thursday the Pentagon is cutting the number of people and aircraft it's sending to the prestigious Paris Air Show following the rift with France over Iraq. The weeklong biennial event for the aerospace industry is to begin June 15." What a snub! Steven Den Beste of USS Clueless sets the record straight: "Maybe the reason a lot of us have that impression is because France is hostile to the US and did try to protect a bloody, dictatorial tyrant. Wasn't it the French President himself who bluntly announced that France would veto any UN resolution which actually authorized war against Iraq? And wasn't it French policy all along that the ‘world's' policy towards Iraq should concentrate on disarmament and specifically eschew ‘regime change'?" Or what about the mysterious case of France v. Colorado? The governor of that state apparently slighted the French by not meeting a consular official last month. As John J. Miller tells the story, "the French embassy is now threatening an economic boycott of his state because of the snub, in an incident that is quickly coming to resemble France's behavior in the notorious XYZ Affair of 1798." France is like the kid everyone remembers when playing street basketball-with the incredible ability to be both player and referee -- a snot nosed whining brat who is more consumed with the idea of rules and getting fouled than playing the game. Basically much of the western world missed something in the last 20 months. George W. Bush and his team, playing Jerry Maguire, spent all night after 9/11 writing up a new foreign policy "mission statement." You could actually envision the slightly crazed surfer dude at Kinko's printing the blessed Bush Doctrine (ending the support and harboring of terrorism) saying to Wolfowitz or whoever picked it up (probably Tommy Thompson), "That's how you become great, man. Hang your balls out there!" Indeed. But then there is France. Playing the Bob Sugar role trying to do business the sleazy old way: "it's now ‘show friends' its ‘show business.'" Only the French would think to write a letter to complain about their victimization by the U.S. government. Who is France's PR guy? The New York Times' Jayson Blair? Back home Democrats in Texas fled the state so that Republicans wouldn't be able to pass some redistricting legislation. Ah, Democracy in action again-another serious answer to a problem. I weep for Iraq if they learn these insane rules. At least the Russians are realistic in their treachery. They want cold hard cash to get on board the latest U.S. plan to lift sanctions on Iraq. What was this article about again? Oh yes, seriousness or something like that. You see America is much like the Los Angeles Lakers. Unless you are from L.A. you probably don't get the idea of being a Lakers fan. And as they lost their chance to four-peat in the NBA championship this week you could see how happy their detractors were. Laker envy, anti-Lakerism, call it what you like. It is a not so convoluted analogy to America and anti-Americanism. France doesn't like that America is pretty much the equivalent of the champions of basketball, baseball, and heavyweight champ all rolled into one, so they write unserious letters. "The key to this business is personal relationships," said Jerry Maguire. In an era of communication France writes childish letters to a superpower who is playing a completely different game. It's a little thing called "throw it down." Poor France you never had me at hello. Jackson Murphy is a commentator from Vancouver, Canada. He is the editor of "Dispatches" a website that serves up political commentary 24-7. You can contact him at jacksonmurphy@telus.net.